Quick and easy vegetarian stuffed tomatoes. What makes these stuffed tomatoes so quick and easy to prepare? The secret is that they aren't actually stuffed! These tomatoes have a filling piled on top rather than stuffed inside, making them the quickest and easiest stuffed tomato recipe you'll ever find. Perfect for dinner, as a vegetarian side dish or a simple vegetarian appetizer. Slice tomatoes in half or slice off the top third of a large tomato and place cut-side up on a lightly greased baking sheet or muffin tin. Season with salt and pepper. In a medium bowl, combine the melted margarine, bread crumbs, Parmesan cheese, and basil or Italian seasoning. 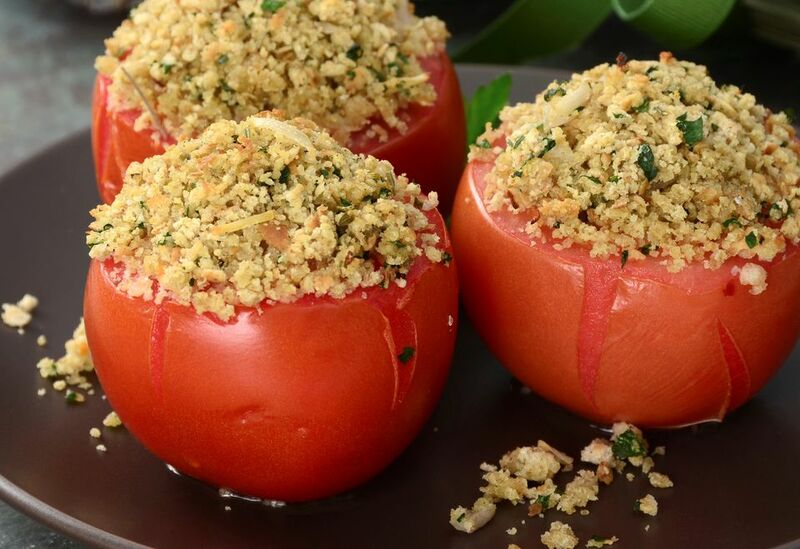 Place a generous spoonful of the breadcrumb mixture securely on top of each tomato. Bake tomatoes for 15 to 20 minutes, or until the bread crumbs on top are lightly golden brown. Enjoy! Do You Know How to Make Baked Vegan Eggplant Marinara?